John Rutherford Allen assumed the presidency of the Brookings Institution in November 2017, having served as chair of security and strategy and a distinguished fellow in the Foreign Policy Program at Brookings. Allen is a retired U.S. Marine Corps four-star general and former commander of the NATO International Security Assistance Force (ISAF) and U.S. Forces in Afghanistan. Allen served in senior diplomatic roles following his retirement from the Marine Corps. He served as Senior Advisor to the Secretary of Defense on Middle East Security, during which he led the security dialogue for the Israeli/Palestinian peace process. 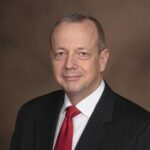 President Barack Obama appointed Allen as special presidential envoy to the Global Coalition to Counter ISIL. Allen’s diplomatic efforts grew the coalition to 65 members, effectively halting the expansion of ISIL.